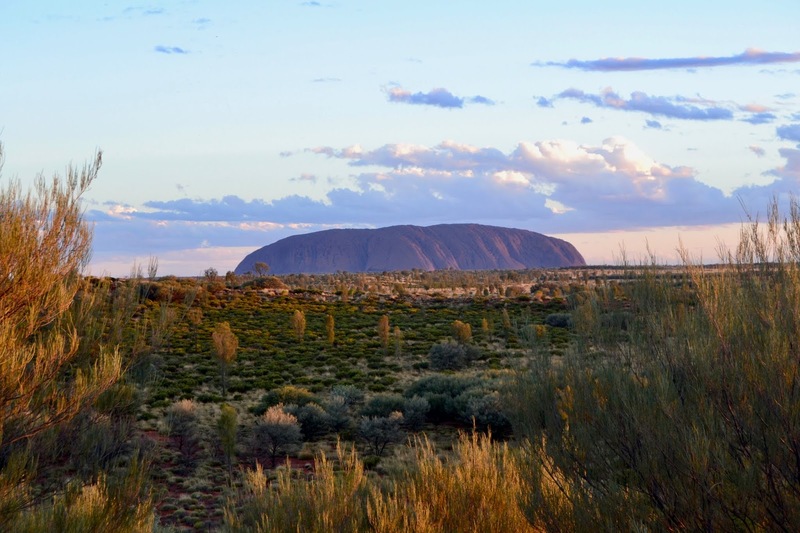 The Uluru is high up on the bucket list of millions of people. The island mountain in the heart of Australia has somewhat become a symbol for the country and while many backpackers skip it, since the trip out to the outback can be quite far and quite pricey, I could not have imagined leaving Australia without seeing it. Our three day outback tour is still one of my absolute highlights of my four months in Australia. For my trip with Tristan we booked our outback tour as well as our in-land flights and our campervan through STA. We decided to fly into Alice Springs from Melbourne as it is so far out in the countryside and driving here not only takes hours on end, it can also be quite dangerous if you have a wreck since it gets so intensely hot here, quite deserted and often very very far to drinking water. 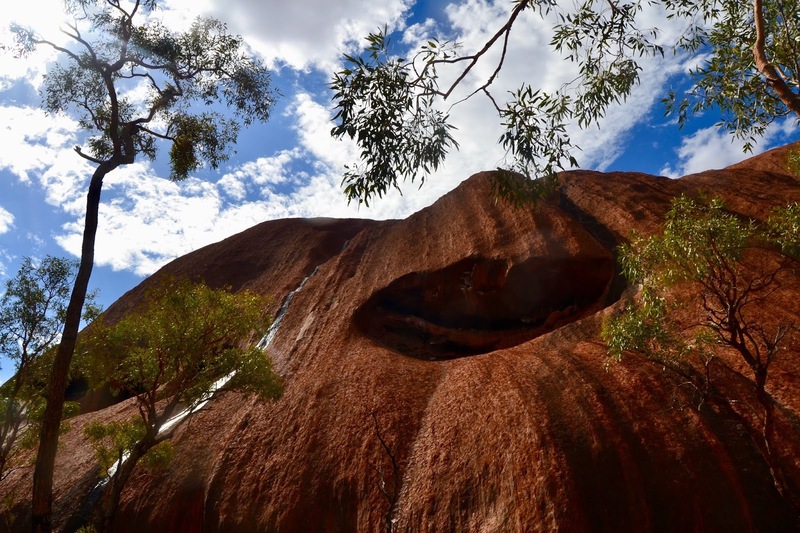 Flights into Alice Springs are generally cheaper than flying directly into the one right by Uluru and take around 1,5 to 2 hours from both Melbourne and Brisbane. We stayed at Alice´s Secret Travellers Inn and absolutely loved it. It´s such a detailed, lovingly decorated, quirky hostel and super inviting. All the rooms are decorated with a theme, there is a pool and they offer an airport shuttle and store your luggage for you during your tour for free. Our tour was a three day tour with Wayoutback . It was a lot of early starts, beginning with our pick up at the hostel at 4:30 am. We then picked up the other members of our group and began our 4 hour drive out to our camp close to the Uluru. On the way we stopped at a little road house for coffee and then prepared lunch at camp (wraps and sandwiches) before finally, finally heading to Uluru. We first stopped at a look out point to get the full panorama before getting closer. I was so pleased with the tour and how respectful it was of the Aboriginal culture, something I was slightly afraid of. 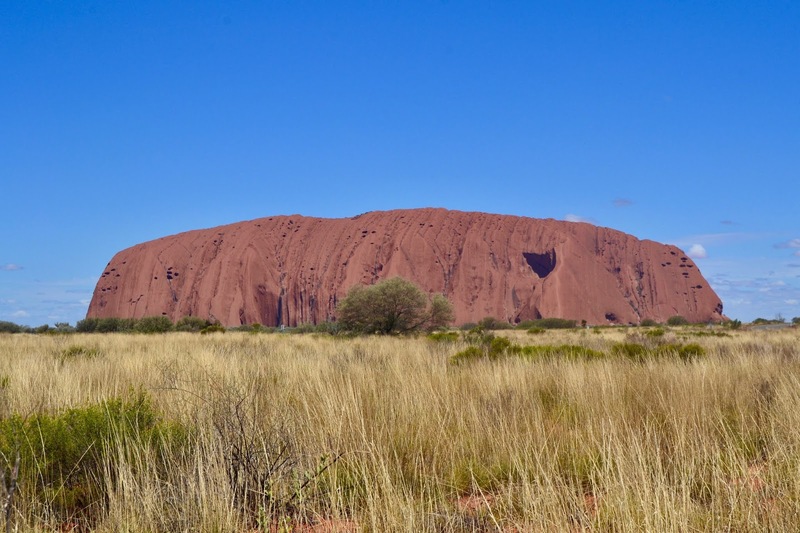 The Uluru is a sacred site for the Anangu people and you should be aware of that when visiting. 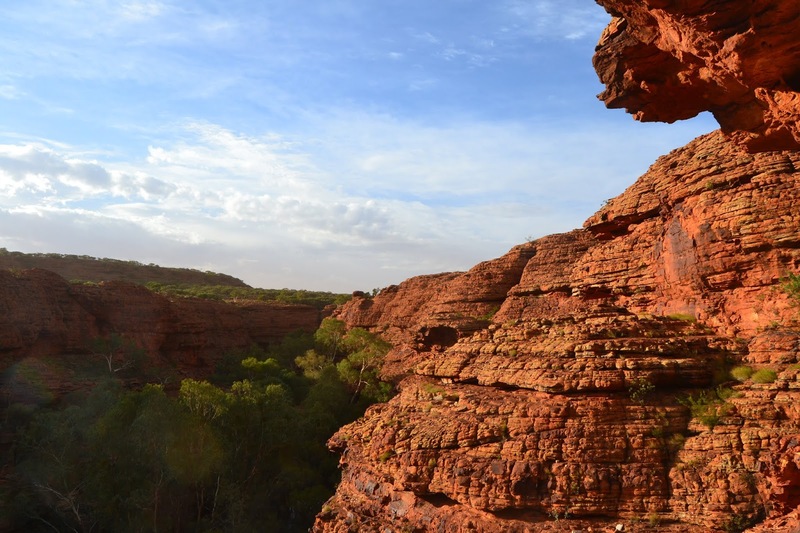 Their land has been given back to them only in 1985 and while it is still technically allowed to climb it, the traditional owners ask visitors not to. You would highly likely not climb a church or mosque if the religious community asked you not to, so I don´t understand why we can´t do the same here. The traditional owners of the land run a cultural centre here, where you can learn about their beautiful creation stories and legends as well as the traditional ways of living. 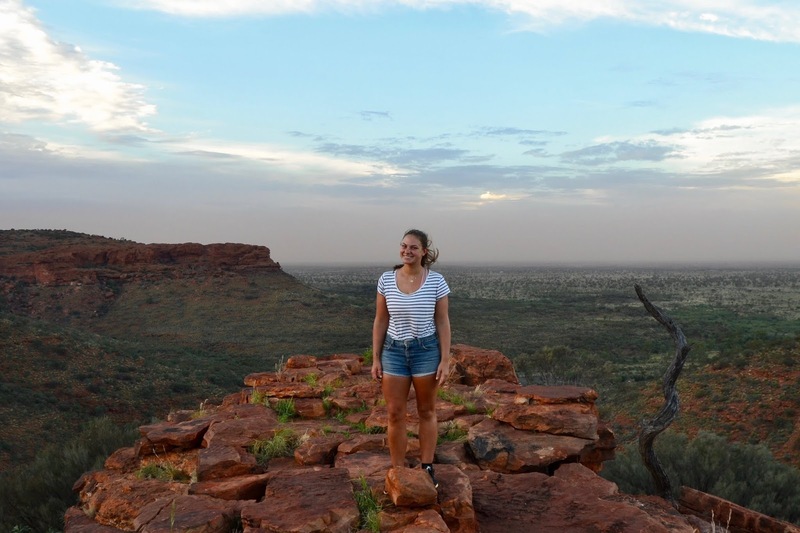 I thought it was so interesting, especially when walking around the Uluru and being able to actually see the markers in nature, that influenced these stories. We spend the entire afternoon walking around and learning about the stories as well as the history of the Uluru. And then we got exceptionally lucky: it started to rain. 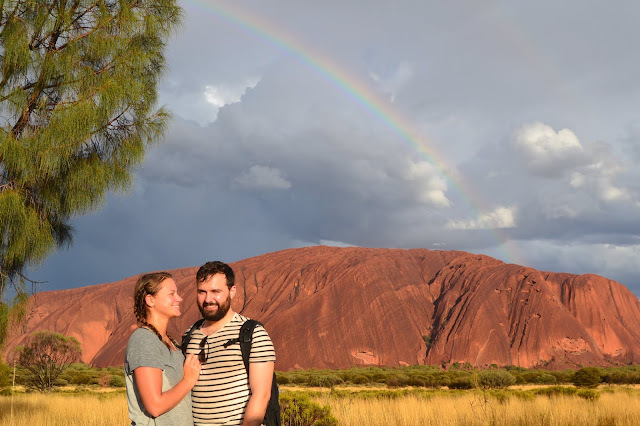 Only 2 per cent of visitors see the Uluru when it is raining and while we were driving away the absolute magic happened: a huge rainbow spread across the Uluru. The rain also allowed us a little luxury since it made us change camps and we got to sleep in actual beds in little huts instead of tents. We had dinner (Chicken stir fry) by the fire and fell into bed absolutely exhausted. We got up super early to see the sun rise over the Uluru, which is a way to get even me out of bed before 6 am. After breakfast (toast, muesli, cereal), we started our drive to Kara Tjuta, for a seven Kilometer hike through the Valley of the Winds. 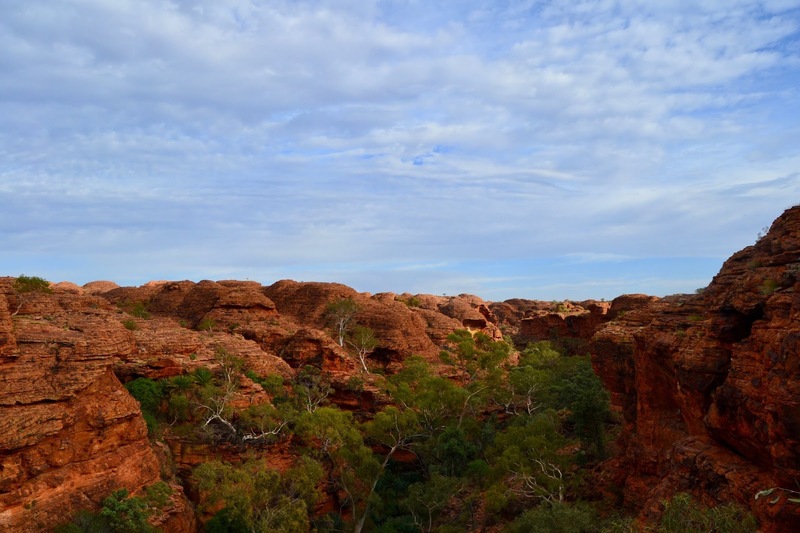 Kara Tjuta means many heads, since there are 36 domes in total. The hike was gorgeous, being surrounded by the red sand stones all around us, a little river and absolutely beautiful nature. You got to do the hike by yourself and at your own pace so even if you don´t hike all the time (cough me cough) it is very manageable. From Kara Tjuta we headed back to camp for a quick lunch before driving to our camp for the last night, close to King´s Canyon. For the last night we got to eat dinner cooked on the campfire and sleeping under the stars. It was absolutely breath taking. Without any light pollution you could see so so many stars. I even saw the milky way moving across the sky, it was absolutely magical. For the last day it was another early rise to get to King´s Canyon before the sun rises for another hike. After a steep climb it was a beautiful easy walk through valleys, domes and into a little lagoon at the bottom of the Canyon. 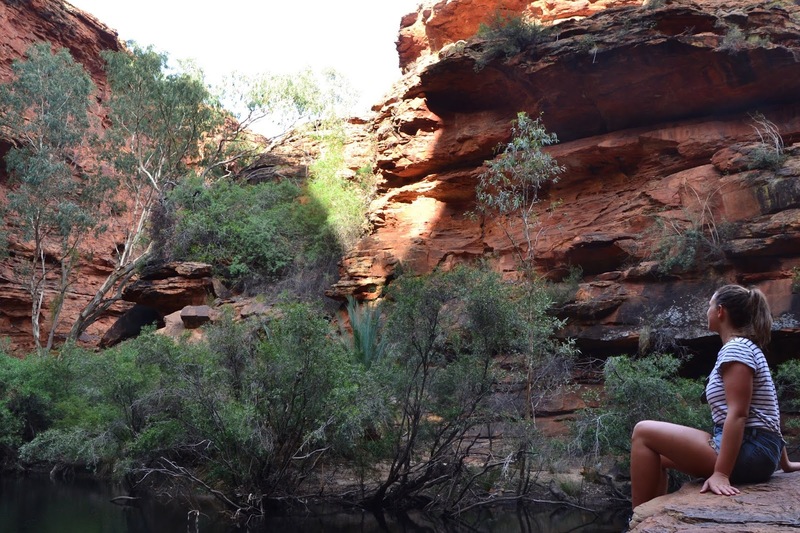 While Uluru was stunning, King´s Canyon was vastly impressive in many other ways. In general while in the outback I felt like we were on a completely different planet, seeing a world that was so so different not only from Europe, but also from other parts of Australia I had seen so far. Seeing a space that was so vast and with so little people was so interesting. From King´s Canyon we headed back to Alice Springs, which took about five hours. I also really enjoyed the long drives, where you got to see so much of the great nature and even amazing little surprises like lizzards and even wild horses. When we got back to Alice Springs I was so full of all these memories, amazing views and gorgeous nature we saw. I would highly recommend anybody to make sure to visit the outback when you are in Australia. It may be far out of the way, it may be expensive, but it is so so worth it in my opinion and such an important part of the Australian continent. Alice Springs felt very much like a transition town with most people either waiting for or coming back from their tours to the outback. It is not the prettiest town, but there are a few things you can do like a visit to the little botanical garden or for a little stroll through the town. I personally would not spend an extra day here and was happy our hostel was so gorgeous and had a very inviting pool to relax at.